Coleus plant, also known as Painted Nettle, is often grown outdoors as an annual because it is frost-tender. But it's easy to grow indoors if you can provide bright light. Distinctive leaf shapes, intricate patterns, and rich colors rival some of the showiest foliage plants. Coleus are one of the rare plants that are grown almost exclusively for colorful foliage. In this regard, they're like crotons, but they're smaller and perhaps somewhat easier to grow inside. Coleus are truly in their glory in masses—their leaves are available in green, purple, orange, red, yellow, and in a striking array of patterns. Coleus are also fun plants to propagate; new plants grown from seed will be new creations. Although I've given directions to grow them year-round, coleus are often grown as annuals and discarded once they become leggy. Light: Bright light, avoiding direct midday sunlight. Too much sun will wash out the colors in their leaves. Water: Keep soil continuously moist throughout the year, but reduce watering in winter. High humidity is preferred. Temperature: Above 60ºF is preferred in the summer. In winter, above 50º is best. By cuttings or seed. Cuttings will be identical to the parent plant, but newly seeded plants will be variable. Plants grown for propagation, however, generally do not look as good as ones grown exclusively for their foliage. The energy of flowering usually saps the plant of some vitality, which is why many growers pinch off flowers. A large coleus will reach only 2-3 feet. They grow rapidly in the spring, but many people don't overwinter them, so they never bother repotting the plant. If you choose to grow coleus for more than one season, you might consider trimming the plant back after the winter, refreshing the soil, and keeping it in the same pot. Alternatively, go up one pot size. Contrary to popular belief, Coleus plants thrive in full sunshine. They will tolerate partial shade, and to some degree, full shade. Leaf drop is common, if the plants do not get enough sunlight, and especially if they are moved from an area of full sun to shade, without an adjustment period. Coleus likes loose and rich soil which drains well. Use plenty of peat moss and other loose medium whether growing in containers, or directly in the garden. Add a general fertilizer regularly. If growing indoors, use a liquid fertilizer every one to two weeks. If planting in your flowerbed, space plants one foot apart. Coleus prefers well drained soil. But, do not be allow the soil to dry out. While many plants wilt and recover, these delicate plants, can wilt and quickly die. Make sure that the container has holes in the bottom for drainage. Keep Coleus plants trimmed. Remove spent blooms, dead or dying leaves, and cut back any stems that are are sick or unsightly. The plant will quickly produce more. Pruning will cause the plant to grow bushier. Coleus is very tender annual, and are susceptible to even a light frost. If you are planning to bring them indoors, do so well before the first frost. In the spring, make sure to leave them indoors, until all danger of frost is past. 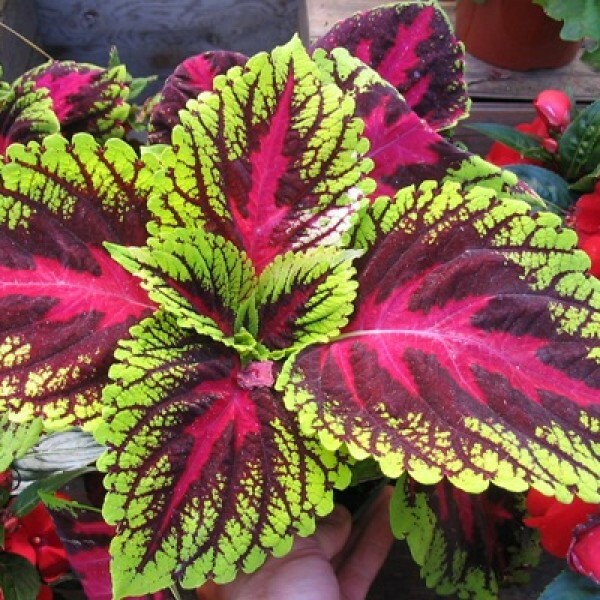 When bringing Coleus plants indoors, leaf drop is a common plant problem. It should be temporary, as the plant adjusts to lower light levels.